No player came up bigger this week than Rytas Vilnius big man Artsiom Parakhouski, the MVP of Top 16 Round 5, whose last-second jump shot meant a one-point road win that saved his team from elimination. Parakhouski's jumper with less than 1 second on the clock gave Rytas a thrilling 77-78 win in a do-or-die game over Partizan NIS Belgrade, eliminating the hosts while allowing Rytas to play AS Monaco next week in a winner-take-all showdown for the last 7DAYS EuroCup Quarterfinals berth. Against Partizan, Parakhouski shined with a game-high 22 points on near-perfect 10-for-11 two-point shooting to go with 8 rebounds and 3 blocks for a performance index rating of 30, the highest among the players on winning teams this round. The highest PIR of the round, 35, belonged to Tyler Larson of Fraport Skyliners Frankfurt, playing in just his second EuroCup game. 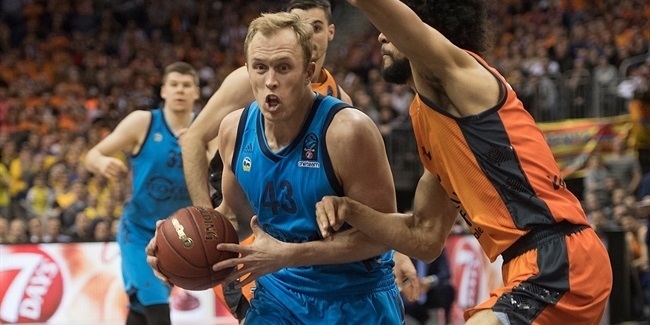 Larson posted 24 points, 9 rebounds, 3 assists and 2 steals in a 68-83 home loss against ratiopharm Ulm. Three players followed with index ratings of 25: Alex Renfroe of Partizan, Justin Cobbs of Cedevita Zagreb and Joe Ragland of Crvena Zvezda mts Belgrade. Renfroe flirted with a triple-double, collecting 11 points, 11 assists, 8 rebounds and 2 steals in the loss to Rytas. 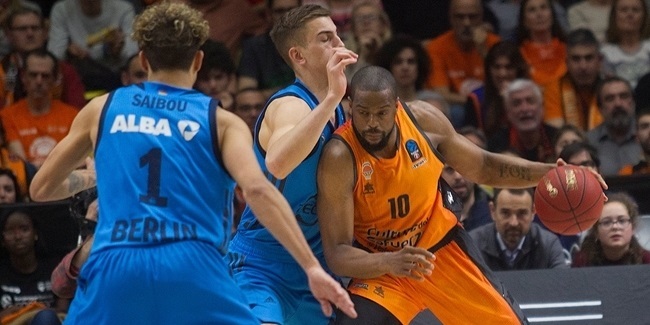 Cobbs had 19 points and 6 assists in an 87-81 loss at MoraBanc Andorra. And Ragland posted 15 points, 6 assists, 2 rebounds and 2 steals in a 72-71 road defeat to Limoges CSP. Larson led all scorers with 24 points this round. MoraBanc's Dylan Ennis is the Top 16's best scorer so far, averaging 16.2 points. Limoges center Jerry Boutsiele had a career-high 13 rebounds, the most of all players this week. Injured LDLC ASVEL Villeurbanne center Alpha Kaba leads the Top 16 with 9.0 rebounds per contest. Renfroe led all players in Round 5 with 11 assists. Renfroe also leads the Top 16 with 7.6 assists per night. Chris Kramer of Rytas and Gerald Robinson of Monaco each had 4 steals to lead the round. MoraBanc's Andrew Albicy is the Top 16 steals leader with 2.3 on average. 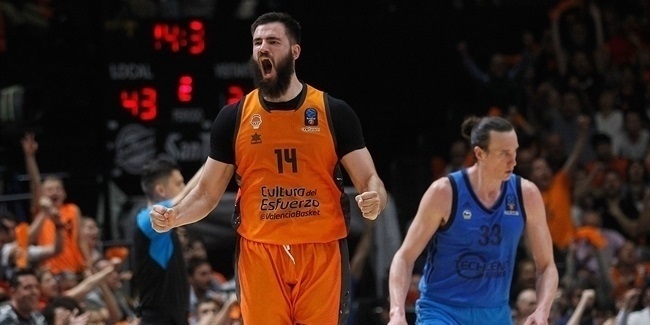 Parakhouski and Eric Buckner of Monaco led Round 5 with 3 blocks each. Buckner is Top 16's top shot-blocker with 2.2 per game.